You Can Win This Painting! This gets harder and harder all the time. I can’t describe the knot I get in my gut when trying to pick a painting that is given away at the end of my Gallery Talks. I really agonize over this choice, wanting to make sure that the selection is truly substantial, really representing my work and having enough meaning for myself that it hurts a bit to give it away. This choice hit all those points dead on for me. The painting for this Saturday’s Gallery Talk at the Principle Gallery is The Warmth of Breath, coming in at 16″ by 20″ on canvas. I am not sure my photography on this painting does it justice, especially in capturing the depth of color. I consider this a very representative piece for my body of work. 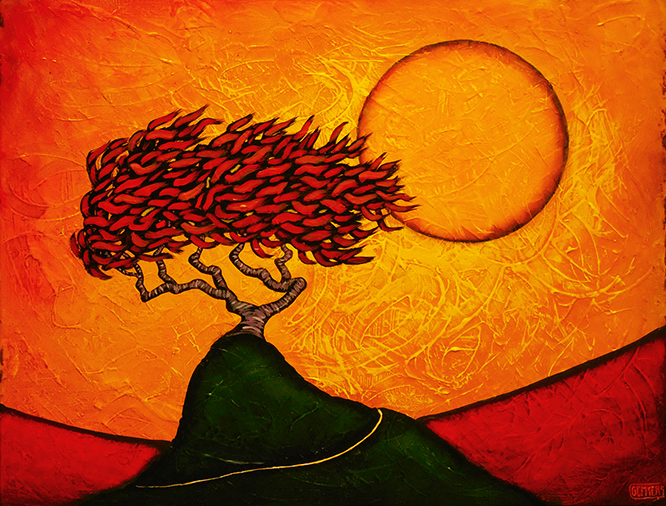 It is simply constructed with deep colors and texture as the signature Red Tree casts itself across the face of the Sun/Moon. It’s a painting that seems to draw my attention, the warmth of it always making me stop to consider it if only for a short moment. The title refers to the thought of being self aware, of recognizing the breath of life that flows through you and bonds you with all living things. There is, for me, a real meditative feel in this painting, one that calms me greatly. I am hoping that it does the same for someone else after this Saturday. So, to recap, this Saturday, September 16, I will be giving a Gallery Talk at the Principle Gallery in Alexandria. The talk starts at 1 PM and if you are in attendance you will have a chance to win this painting. Plus, there are a few twists I have planned that I can’t disclose here but I think will please those at the talk. It could involve card tricks, juggling, mind reading, interpretative dance, yodeling or a combination of all of these things. You will have to come to the Principle Gallery on Saturday to discover what I mean.